I spent several hours preparing on Friday for celebrating Thanksgiving on Saturday. We're having a guest who could only be here on the weekend since Thanksgiving is not a holiday here in Poland! Plus, this gives my husband a couple extra days to try to recover and heal before he has to go down the stairs. He's been pretty confined to the upstairs these days. For us to get a whole turkey isn't quite as easy as the typical American. We ordered ours from a local poultry processing plant - so it's very fresh. Mike ordered it on Thursday and I picked it up this morning. It's about a 19 lb. bird. Hopefully we'll have lots of leftovers. Our menu will consist of Turkey and dressing, cranberry sauce (purchased! ), mashed potatoes (the real deal - no dried and quick and easy here) and gravy (from a package), homemade rich hot rolls with peach jam (purchased jam), fruit salad, sweet potatoes, and for dessert - Danish Apple Dessert. It's sort of like apple pie - but in a big pan. Pumpkin pie usually gets passed over because we all prefer apple pie, so I'm not making any. This is kind of a minimized Thanksgiving dinner - "only the necessities. I'm skipping green bean casserole and even corn! So, as you continue your sewing and/or shopping this Thanksgiving weekend - or are you decorating - have a good one! Don't forget - It's Small Business Saturday! Don't forget about my sister's "bonus special" this weekend at the shop. 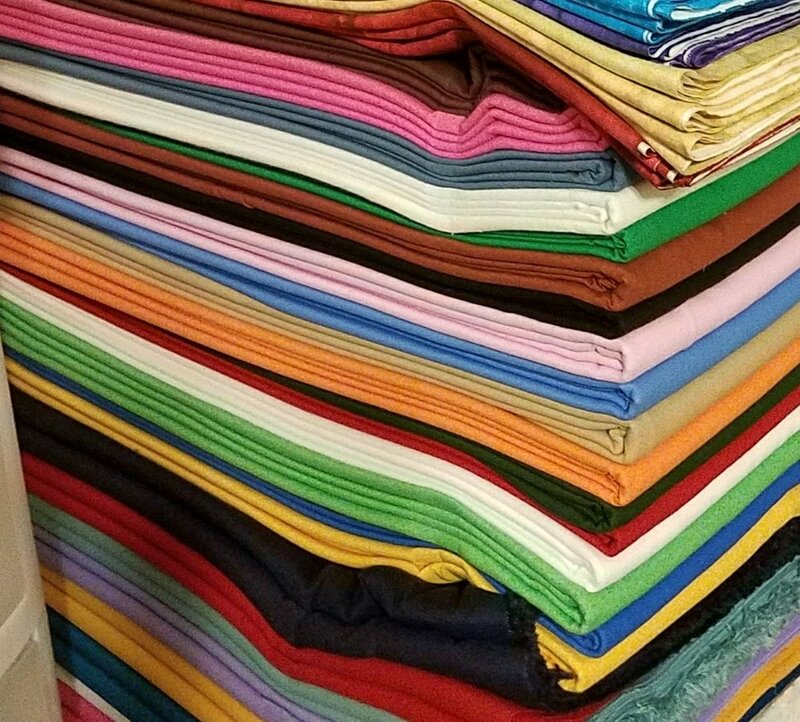 For every $25 in fabric or other items you buy from her shop, you will get 1 yard of solid cotton for free! That's it from here on the home front in Poland. Have a great weekend! Oh yes, below are some FabriQuilt fabrics that my sister just got in - such a deal for beautiful fabrics! Check them out!